This year again, Animal Friends organizes Animal Friends Days and marks important international days concerning vegetarianism and animal rights and protection. We will be focused on direct informing of citizens. On Friday, October 1, 2004, World Vegetarian Day, we will hold all-day info stand and, at noon, prepare tasting of vegetarian food. Our guest at the tasting will be veteran animal rights activist from the UK, Mrs. Anne Ashley. Info stand will be set in front of Dubrovnik Hotel in Gajeva ulica, and visitors can get all information concerning ever growing vegetarian movement over treats of vegetarian cuisine. Later that day, at 5:30 P.M. in club Mama, Preradoviceva ulica 18, Anne Ashley will hold lecture along with projection of a film regarding animal rights activism in the UK called "Animal rights in the UK - activism or terrorism?" 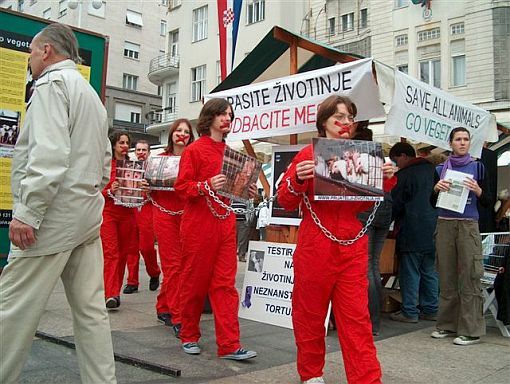 Saturday, October 2, 2004, World Farm Animals Day, our activists will also spend in front of Dubrovnik Hotel. Visitors on our info stand could get information on farm animals through leaflets, info panels, and direct queries to our activists and also get free samples of soy chunks with recipes. 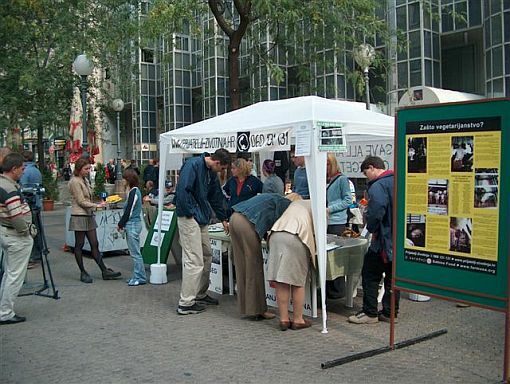 On Sunday, October 3, 2004, World Day of Laboratory Animals, Animal Friends will hold info stand in Maksimir Park as a part of program of the City Department for Agriculture and Forestry. All day long we will be at everyone's disposal and give information on animal rights and protection through texts, pictures and films. Black and white list of producers of cosmetics will be handed out. Monday, October 4, 2004, World Animal Protection Day, our organization will mark at Ban Jelacic Square and set info stand as a part of programme of City Department for Agriculture and Forestry. There will be a performance at noon. Our activists, wearing red jumpsuits, chained and with their mouth sealed with insulating tape will hold pictures of caged animals and that way symbolically display modern slavery, that is, warn about hundreds of billions of animals that are every year slaughtered and tortured by man. Petition for support to proposal for new Animal Welfare Act, that now waits to be discussed upon in Parliament, will be signed every day. We ask all citizens to join us at the Animal Friends Days and help us fight for those who can't fight for themselves. 10/02/06 Performance "Meat is Murder"